Remove a Sensor - NexSens Technology Inc.
A sensor can be removed from an iChart project file if the system setup has changed or needs to be redone. 4. 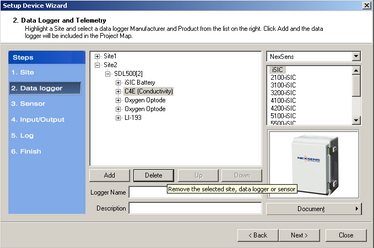 Select the sensor to be removed by clicking the + next to the data logger. 6. Click Next until step 6 is reached. 7. Select the data logger to which the removed sensor was on.